The Minor Labor Laws is a child labor law poster by the Ohio Department Of Commerce. This poster is mandatory for some employers, including employers of minors. This poster must be posted in a conspicuous place where all minor employees will see it. This poster describes the restrictions on the hours that minors can work in a week as well as per day in regard to school weeks and non-school weeks. The poster also describes and lists the employment options in which minors may not work. OH All-In-One Labor Poster: Instead of printing out dozens of posters, employers can also purchase an all-in-one poster that covers both Ohio and Federal poster requirements by clicking here . It appears you don't have a PDF plugin for this browser. Please see the link below to download ohio-laws-mllposter.pdf. WORKING PERMITS: Every minor 14 through 17 years of age must have a working permit unless otherwise stated in Chapter 4109.
month, year or per piece for work performed. REST PERIOD: No employer shall employ a minor more than 5 consecutive hours without a rest period of at least 30 minutes. be kept for two (2) years. training, work-study, or other work-oriented programs with the purpose of educating students, and the program meets standards established by the state board of education. 2. After 11 p.m. on any night preceding a day that school is in session. 20. Wrecking, demolition, and shipbreaking. 8. Not employ minors under 16 in door-to-door sales activity before 7 a.m. or after 7 p.m.
9. Not employ minors 16 and 17 years of age in door-to-door sales activity before 7 a.m. or after 8 p.m.
Department of Commerce website at www.com.ohio.gov. There are an additional four optional and mandatory Ohio labor law posters that may be relevant to your business. Be sure to also print all relevant state labor law posters, as well as all mandatory federal labor law posters. 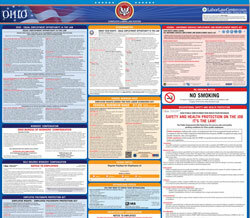 Instead of printing out pages of mandatory Ohio and Federal labor law posters, you can purchase a professional, laminated all-in-one labor law poster that guarantees compliance with all Ohio and federal posting requirements. Fully updated for 2019! While we do our best to keep our list of Ohio labor law posters up to date and complete, we cannot be held liable for errors or omissions. Is the poster on this page out-of-date or not working? Please let us know and we will fix it ASAP. LaborPosters.org will email you a printable PDF of this Ohio labor law poster, 100% FREE. You'll also get notified when new posters are available. Your Ohio poster has been downloaded and emailed! This poster download is provided as-is, with no warranty or guarantees. Please verify with Federal and Ohio authorities to confirm that you are posting all of the correct (and updated) posters required for your type of business. Instead of printing out pages of mandatory Ohio and Federal labor law posters, you can purchase a professional, laminated all-in-one labor poster.